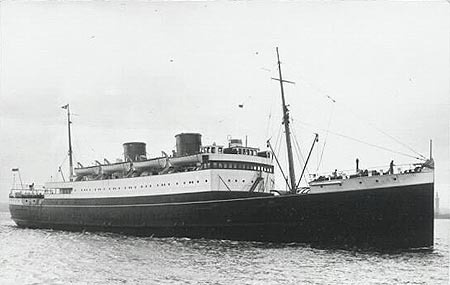 Coast Lines had been acquired by Lord Kylsant's Royal Mail Steam Packet group in 1917. 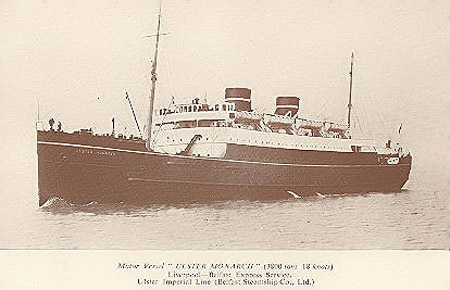 The pioneering large passenger motorships of the Royal Mail group, including ships for White Star, Union-Castle and Royal Mail itself, are well known. 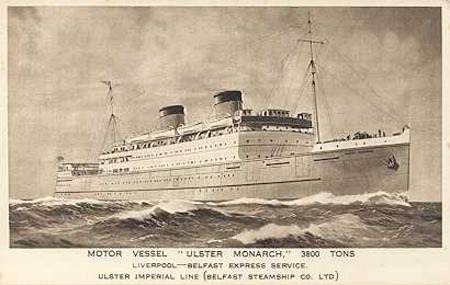 In 1929, the Belfast SS Co received the first of three 3700ton Harland and Wolff motorships, the Ulster Monarch, displaying a cut down version of the standard two-funnelled outline. The second and third ships were delivered in 1930, and were named Ulster Queen and Ulster Prince. 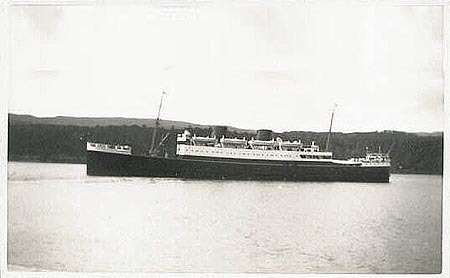 They were the world's first diesel cross-channel ships, and a fourth ship smaller ship, the Innisfallen, was delivered for the City of Cork SP Co. The design was developed over the next 17 years through nine further ships, all with just a single funnel. Arguably what was a pioneering design in 1929 was rather outdated by the time of the last ship in 1957. That two of these ships are still in service in 1999 shows how well they were built, now owned by the same company following the takeover of Royal Olympic (Orpheus, ex-Munster (1948) by Louis Cruise Lines (Princesa Amorosa, ex-Scottish Coast (1953). 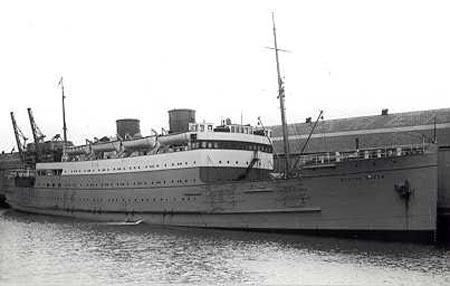 Only one of the initial trio returned to Belfast SS service after WW2, the Ulster Monarch. She was scrapped in 1966. 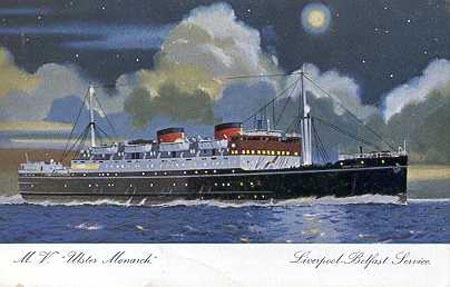 Belfast SS Motorships - Detailed history of the Liverpool-Belfast motorships - this page! 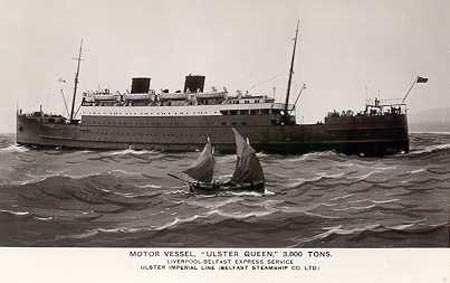 In 1929, the Belfast SS Co received the first of three 3700ton Harland and Wolff motorships, the Ulster Monarch, displaying a cut down version of the standard two-funnelled outline. 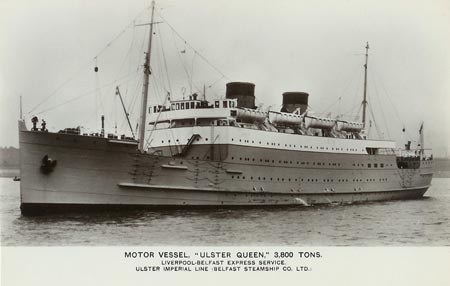 The second and third ships were delivered in 1930, and were named Ulster Queen and Ulster Prince. They were the world's first diesel cross-channel ships, and a fourth ship smaller ship, the Innisfallen, was delivered for the City of Cork SP Co.
Ulster Monarch, was delivered with a light grey hull, but the colour proved to be impractical and was later replaced with black. The fornt of the boat deck beneath the bridge was originally open, but was soon enclosed with wooden-framed windows. In 1938, a blue band was added to the traditional red and black Belfast SS funnel, to make them to same as the new Burns & Laird colours applied to the first two standard motorships added to that fleet. There was talk of amalgamation of the two fleets at the time, but nothing came of it. The black hull was applied around the same time. 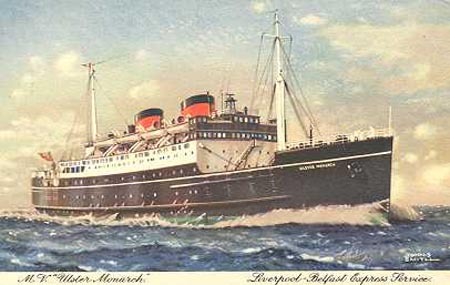 Ulster Monarch was the only one of the trio to return after WW2. 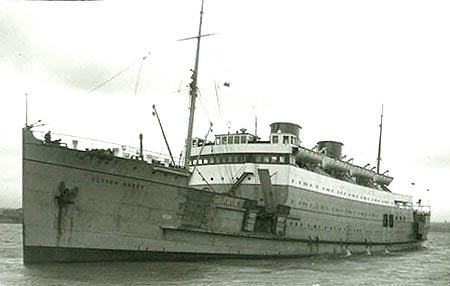 Ulster Prince was wrecked at Nauplia in Greece in April 1941, whilst trying to evacuate UK troops. She was destroyed the following day on 25th April 1941 by Stuka dive bombers. 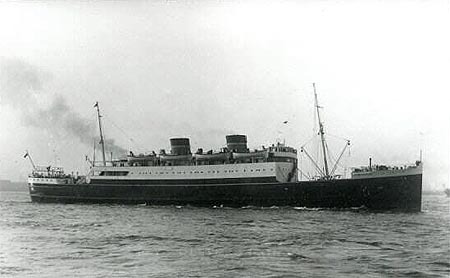 Ulster Queen was running the Liverpool-Belfast service alone in 1940 when she ran aground of Maughold Head on the Isle of Man on 28th February. She was not refloated until 27th March whne she was taken to Belfast for repairs. She was then requisitioned by the Admiralty and converted into an auxiliary anti-aircraft cruiser. 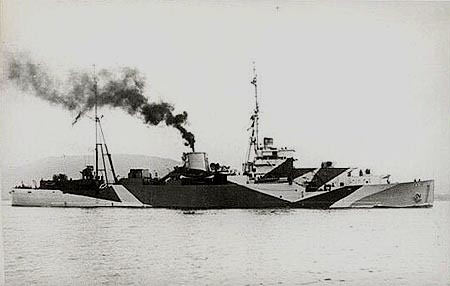 HMS Ulster Queen was substantially modified with the removal of her boat deck and one funnel. Armour plating was added to the hull sides and she had been armed with six 4.0in guns plus smaller AA weapons. The conversion was successful and she was purchased outright by the Admiralty. HMS Ulster Queen served with the Russian convoys, in the Mediterranean and in the Far East before being paid off on 1st April 1946. The modifications were too substantial to return her to passenger service, and she was sold for scrap. Ulster Monarch's funnels reverted to red and black after the war, and shortened funnels were installed to reduce top weight. This class was renowned for rolling in high seas. 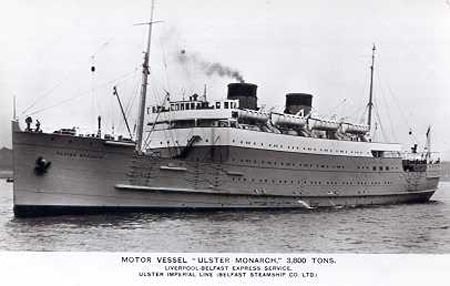 Ulster Monarch was the only one of the initial trio which returned to Belfast SS service after WW2. She was scrapped in 1966. 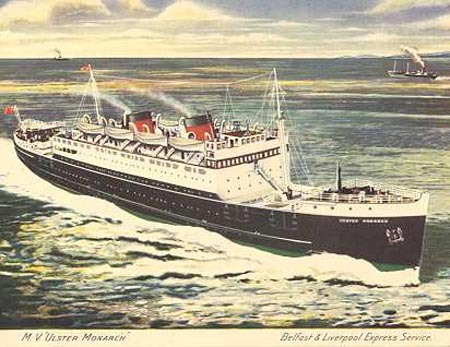 An early official Belfast SS card of Ulster Monarch, with original light grey hull, and before windows were added on the forward boat deck. 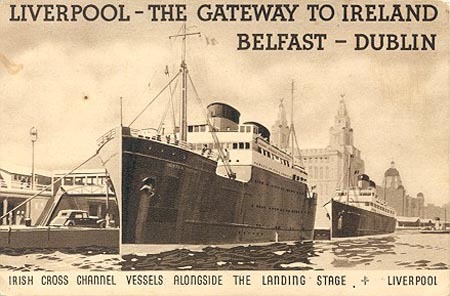 The Liverpool-Belfast route was marketed as the Ulster Imperial Line, which continued until after WW2. Another official Belfast SS card of Ulster Monarch, with original light grey hull. The boat deck beneath the bridge was protected with windows at an early stage - compare with the card above. 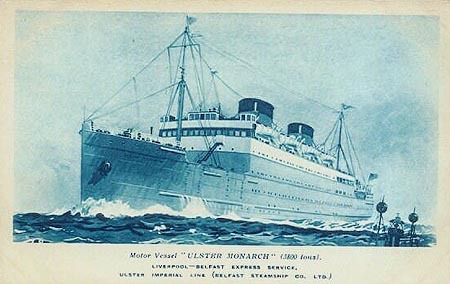 The blue version of the official Belfast SS card of Ulster Monarch shown above. 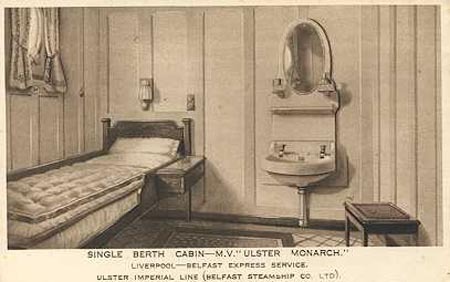 An official Belfast SS card of a single first class cabin on Ulster Monarch. 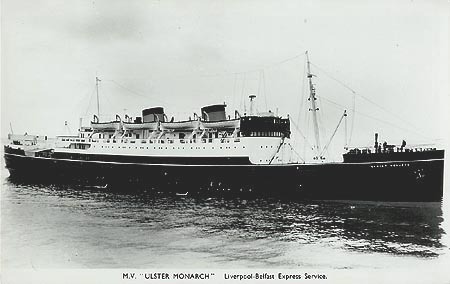 An W.E.Walton photographic card of Ulster Monarch, with original light grey hull. The colour proved to be impractical and was later replaced with black. An early card - the boat deck beneath the bridge is not yet protected with windows. An official Belfast SS colour card of Ulster Monarch. amalgamation of the two fleets at the time, but nothing came of it. The black hull was applied around the same time. An official Belfast SS postcard of Ulster Monarch. A postwar official Belfast SS colour card of Ulster Monarch, after funnels reverted to red and black. 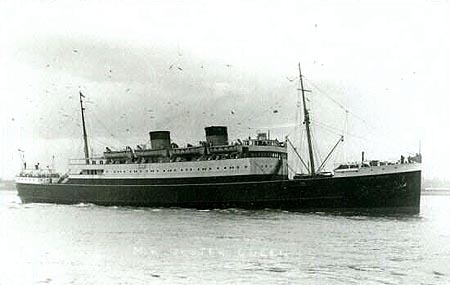 The Ulster Monarch was the only one of the trio to return to Belfast SS service after the war. Another postwar official Belfast SS colour card of Ulster Monarch, after funnels reverted to red and black. 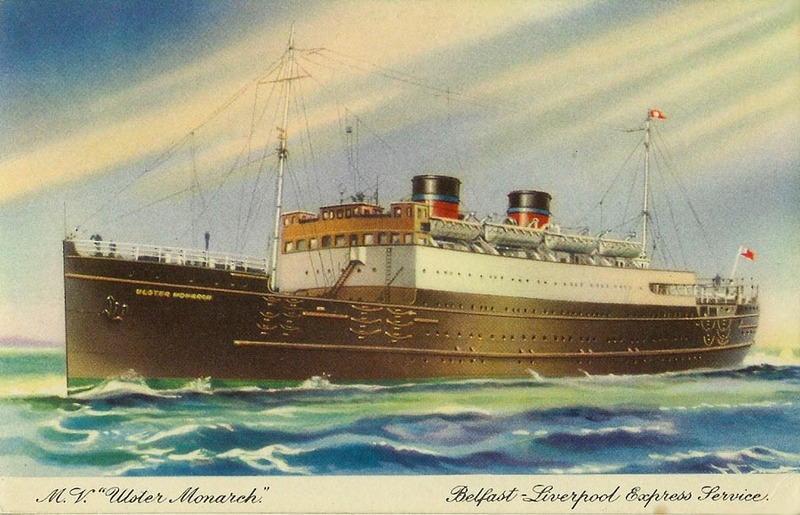 An interesting card of Ulster Monarch, with a Dublin boat astern, at Liverpool Pier Head. Another postwar official Belfast SS colour card of Ulster Monarch. This shows the shortened funnels applied to reduce top weight. This class was renowned for rolling in high seas. 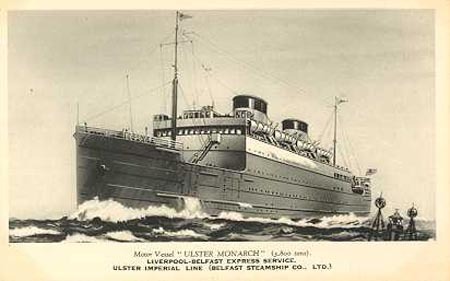 A late official card of Ulster Monarch, with later small funnels. 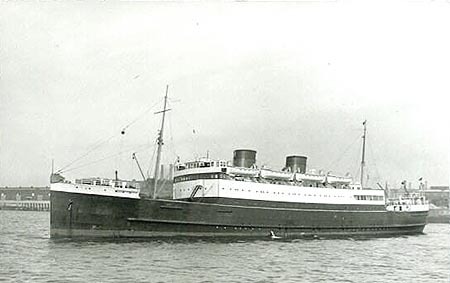 Ulster Queen was running the Liverpool-Belfast service alone in 1940 when she ran aground of Maughold Head on the Isle of Man on 28th February. She was not refloated until 27th March whne she was taken to Belfast for repairs. She was then requisitioned by the Admiralty and converted into an auxiliary anti-aircraft cruiser. 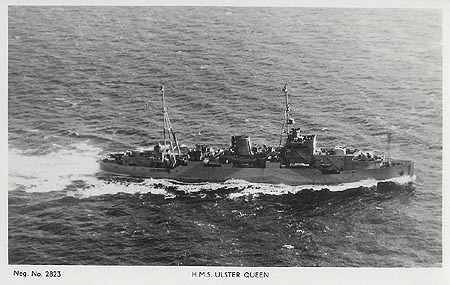 HMS Ulster Queen was substantially modified with the removal of her boat deck and one funnel. Armour plating was added to the hull sides and she had been armed with six 4.0in guns plus smaller AA weapons. The conversion was successful and she was purchased outright by the Admiralty. HMS Ulster Queen served with the Russian convoys, in the Mediterranean and in the Far East before being paid off on 1st April 1946. The modifications were too substantial to return her to passenger service, and she was sold for scrap. An early official Belfast SS card of Ulster Queen, without widows on the forward boat deck. 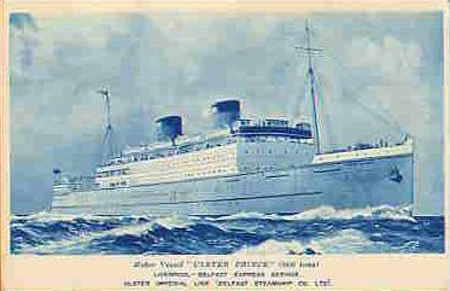 An official Belfast SS card of Ulster Queen, with original light grey hull. An official Belfast SS card of Ulster Queen - colour & font variation on the card above. An W.E.Walton photographic card (on a painted sea) of Ulster Queen, with original light grey hull. 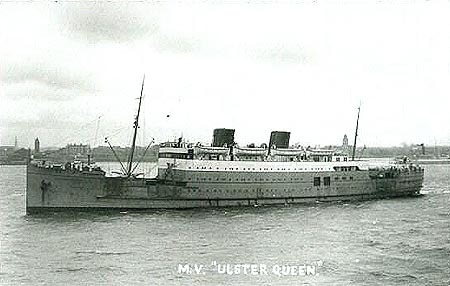 An unidentified photographic card of Ulster Queen, with the light grey hull already showing signs of wear. 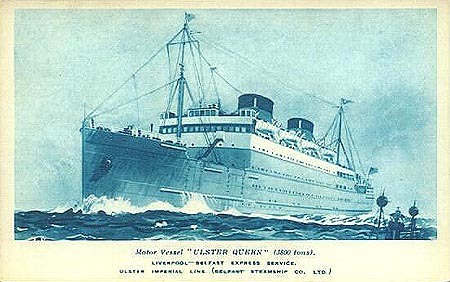 A different copy of the photographic postcard above of Ulster Queen. An unidentified photographic card of Ulster Queen. direction ship, and did not return to commercial service after the war. She was laid up, and eventually scrapped in 1950. 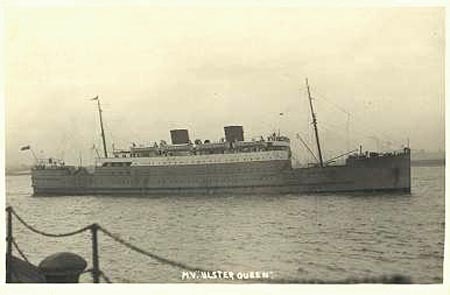 Photographic postcard of Ulster Queen on the Mersey. Photographic postcard of Ulster Queen with black hull, on the Mersey. Photographic postcard of Ulster Prince on war service. 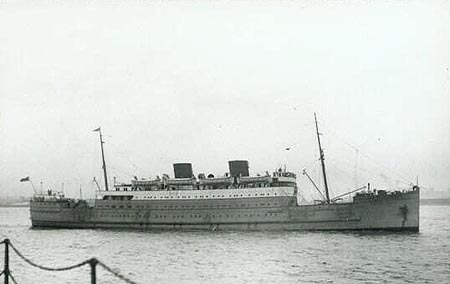 Ulster Prince was wrecked at Nauplia in Greece in April 1941, whilst trying to evacuate troops. She was destroyed the following day on 25th April 1941 by Stuka dive bombers. 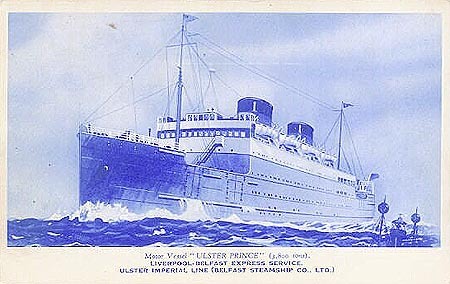 An official Belfast SS card of Ulster Prince, with original light grey hull. An W.E.Walton photographic card (on a painted sea) of Ulster Prince, with original light grey hull. 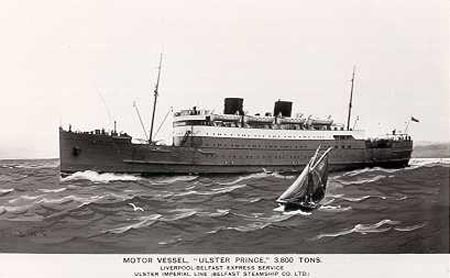 Ulster Prince was lost during the evacuation of Greece in 1941. An unidentified photographic card (BSS official?) of Ulster Prince. 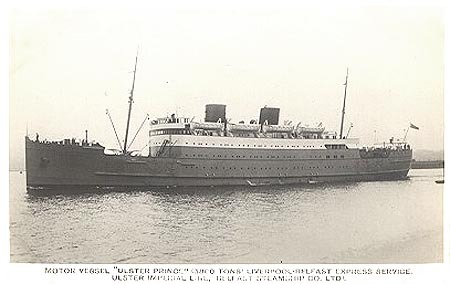 Photographic postcard of Ulster Prince with black hull. Photographic postcard of Ulster Prince with black hull and "Burns & Laird" funnels, on the Mersey. This ship was transferred to Belfast SS after WW2, to run the service alongside Ulster Monarch, the only survivor of the original trio. She was built as the Leinster in 1937 - Follow this link for her history.